A David Bowie ballet tribute is set to make its world premiere at Music Hall in Detroit on Saturday June 18th! 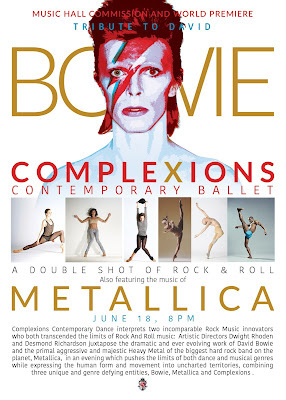 Music Hall Commissions a World Premiere -- A Tribute to David Bowie by Complexions Contemporary Ballet is a rapturous theatrical homage to the legend and innovator. Described as a Rock Opera-like production, the ballet interprets four decades of Bowie's iconic music with the help of artistic directors Dwight Rhoden and Desmond Richardson. "This new work takes an array of his hits over these 4 decades and lays a visual imprint of his - style, character, intensity, androgyny and his restless invention as an artist and creates a Rock Opera style production in his honor. The ballet takes the rebel spirit and creates an environment with a deft theatricality shaded with a luminous palette - that chronicles the heart of each song through dance wrought with emotion. The ballet will play from section to section like a rich tapestry that shows Bowie’s ability to conquer virtually any musical notion with ease. Conveyed with a loose narrative and a movement vocabulary that uses Contemporary Ballet, popular dance vernaculars, his singular idiosyncrasies and Inspirations from Bowie’s many personas, this premiere sets out to deliver a smooth, high voltage romp to highlight his truly original legacy." The event will also feature the music of Metallica. 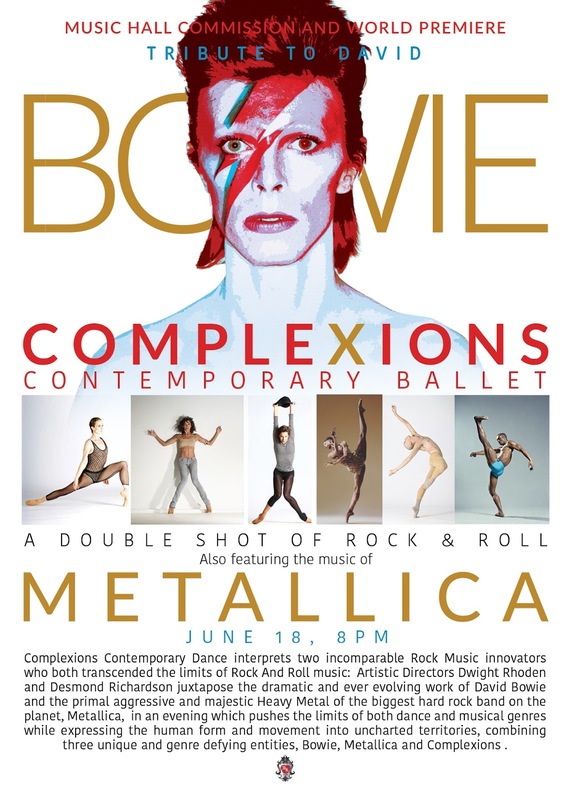 For more info on A Tribute to David Bowie by Complexions Contemporary Ballet and/or to purchase tickets, visit Music Hall on the web.